It’s been nearly 10 months for me in South Africa and I have experienced many things here. I think I will be able to explain something about South Africa now. Food: You can find too many Indian restaurants in Johannesburg. Renowned ones are Taste of Punjab, Vintage India, Delhi Darbar etc. You can also find KFC, Mcdonalds and many burger joints which are really good (esp. if you are non-vegetarians). Grocery: There are 2 big Indian/Pakistani market in Johannesburg Fords burg and Laudium. You can find all type of spices and other grocery items here which you can’t find it in stores. Other things you can find it in PicknPay, Makro and FruitnVeg. Transportation: This is the biggest problem in Johannesburg rather in South Africa, you should have your own vehicle otherwise it’s very difficult to travel around. There are many agencies who give car on rent. Your Indian license is valid here and the driving style is also same as India. Shopping Malls: There are too many malls in Johannesburg Monte Casino, Sandton, Rosebank, Hyde Park, Cresta, Bright Water commerce. You can enjoy Hindi movies also in Numetro @ Monte Casino & Hyde Park Mall. You can also find some renowned African craft markets like Bruma and Rosebank. Carlton Panorama - At the Carlton Panorama you will have some very wonderful views of the city from the 50th floor tallest building in South Africa. Sun City - Sun City Tour with its casinos and roulette tables and beaches this proves to be a very fun outing. Lesedi Cultural Village - You can see how the people live there with their cultural dance and much more. Gold Reef City - Spend some time at the Gold Reef City is a reproduction of the city of Johannesburg in the early 1900’s. Johannesburg Zoo - A day at the Johannesburg Zoo is a joy. You will see so many animals and enjoy all the exhibits. Johannesburg Planetarium - There is a tour of the planetarium that takes two hours to shows and explains about the planets. Rhino & Lion Nature Reserve – A very good place for one day picnic. You can also visit wonder caves inside this park. Nelson Mandela Bridge - The largest the 284 meter long cable-stayed bridge in South Africa. Mandela Family Museum - Nelson Mandela's house in Orlando West, Soweto, now called the Mandela Family Museum. Montecasino – One of the best complexes in Johannesburg with an array of restaurants that include Japanese, Portuguese, Mediterranean, Eastern fusion and, of course, Italian. There is one huge casino and Numetro multiplex. Museum Africa - Museum Africa’s focuses on indigenous African cultures, history and archaeology, and linguistics, and the collection of rock art. National Museum of Military History – You can see collection of weapons, military aircraft, medals, uniforms and other war memorabilia. Apart from this there are many good places which you must visit when you are in South Africa. Venice has 2 airports ... the one that caters more to international flights is called Marco Polo airport and it is situated towards the outskirts of Venice. There is nothing very close the airport tourism wise and living close to the airport does not make much sense since everything is too far away from here. The other airport is called Treviso airport which is also situated on the outskirts of Venice and it is also quite far away from major tourist destinations. It caters more to the low-cost airlines along with some domestic Italian airlines. Most of the time, you will be dealing with Marco Polo and not Treviso. There are 2 major train stations in Venice called Venezia-St Lucia and Venezia-Mestre. There is a ACTV (regional transport body) bus that connects you to Venezia-Mestre from Marco Polo. The bus number is 15 and its frequency is once every 30 minutes. The bus stop for this is directly outside the arrivals section of the airport. You dont have to move an inch. It takes close to 40-45 minutes to reach Venezia-Mestre from the airport by bus. Conveyance wise ... Venice is quite well connected especially for a tourist. The best way to reach the heart of the city is to hop on to an Alilaguna boat. It is called Vaporetti more commonly in Italian which translates to water bus in English. This is the best way to roam around in Venice. There are outlets in the airport itself, very close to the arrivals section where you can buy train, bus and Vaporetti tickets. There are quite a few flexible options regardless of whether you are travelling by boat, bus or train. You will seldom require the services of a train since there is no metro service in Venice as such. But you will require bus and Vaporetti. There are daily passes available as well as weekend passes along with 3 day, 4 day and 5 day passes. For bus, you can buy a one time pass too ... which costs you 1.10 Euro and you can travel for 75 minutes in one direction using this on any number of buses. Remember its one direction only. So you cant use it to go from airport to Mestre and back. Italy is also a bit cumbersome when it comes to tickets. When you buy this ticket, you are still not eligible to travel on the bus. You need to get into the bus and get your ticket validated. Crap. There are validating machines on the bus. You need to put your ticket inside these machines and then the machine prints something on your ticket and throws it out again. Some buses also have detector machines. So you dont need to put your ticket inside but you just need to flash it in front of the detector. You HAVE to buy one of these. Its very very convenient and it saves you a lot of money. For example, travelling one time from airport to San Marco (the centre of Venice - tourism wise) is 13 Euros per person. This is very expensive. So you have to buy a pass which you can use both on the bus as well as Vaporetti. Buy it at the airport itself. It is a budget hostel and it is very similar to most of the budget hostels available in Europe. Most people here tend to stay at hostels rather than hotels because they are cheap. Frankly, hostels themselves are so sophisticated that you dont need to worry about it at all. The expenses here were 30 Euros per person per night. Each room allows only 3 people. If you wish to accomodate more people, they charge 20 Euros per extra person. There is a club inside Villa Dori itself where you can get booze and food along with a dance floor. 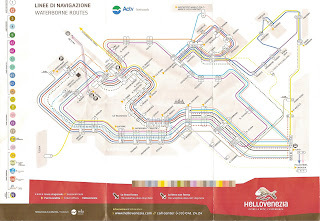 The way to get to Villa Dori is: Hop onto a number 15 bus from Marco Polo. Get down at Mestre. Then change to number 25 and get down at the second last stop called Ca Sabbioni. Ask anyone for directions from here. Its actually quite simple. The hotel is bang in front of Ca Sabbioni. Plus there are tons of other hostels available. You just need to google a bit. For example, there is a chain of hostels in Europe by the name of Camping Village. We stayed at one of their hostels in Rome ... which I will write about in the post for Roma ... so getting accomodation is actually very simple. Lets come to the business end now ... what and how to roam around in Venice. Venice is quite a strange city. There is a vast divide between the tourism part of the city and the more modern part. You will be roaming around in the former. San Marco - the major tourist attraction in Venice. Its a typical Italian Piazza. So you will find this place very crowded. There is the statue of Marco Polo when you get down at San Marco. You walk your way down towards the San Marco Square. You will find the Bell Tower as well as St Mark's Basilica in this square and a huge open space in front. You can safely go inside the Basilica without paying anything but you need to pay 4 Euros to go up on the 1st floor ... there is a kind of a gallery there where you can stand and just have a look around Venice. There is an Indian hotel that we found in Venice called Ganesha. It is run by a Punjabi man and believe me it has authentic Indian taste. We just gorged on the food dished out. You will need to board a water bus from Piazzale Roma to a water bus stop called Riva Di Biasio. Get down here and ask for directions to Ganesha. It is 10 minute walk from Riva Di Biasio. There is a nice musuem called Doge's place too which cannot be missed. Venice is well connected via Eurail to most cities in Germany, Switzerland and Austria.